Mr. Nappier is a true professional and works diligently to take care of his client. My father was a Korean War veteran. He passed away 2008. My mother is still with us, but her finances are limited. I had tried numerous occasions to get financial support from the VA to help with Mom's healthcare - to no avail. No one at the VA provided proper guidance or assistance to accomplish this goal. Through a happenstance event, we came to know Mr. Nappier. I shared with him the events that had taken place. He quickly led us through the process and helped us secure the healthcare financial support my mother needed. Our hats are off to you Mr. Nappier. Having Steve Nappier help us through the process of applying for VA benefits was a blessing from the Lord. His attentiveness and promptness to my mother's case was greatly appreciated. He is so easy to talk to and explains each step of the process clearly. I tell everyone - even if you think your situation looks hopeless, let Steve Nappier look at it first before you give up. He provides an outstanding service to our veterans and their families. THANK YOU SO MUCH FOR YOUR ASSISTANCE WITH THE VA CLAIM. I APPRECIATE THE SWIFT MANNER IN WHICH YOU HANDLED THE PAPERWORK. On behalf of my parents, I want to thank you for your dedicated and professional work in obtaining Veterans Aid and Attendance benefits. My dad is a 91 year old WWII veteran who has never received any VA benefits until now. You came highly recommended from more than one source and you certainly have lived up to your reputation as a professional VA Independent Claims Agent. Through my participation in this process, providing necessary documentation to you that is required by the VA, I realize that this is absolutely not something a Veteran or Veterans family should undertake without professional help. I have heard nightmare stories from families who went it alone. Obtaining approval can take as long as 9 months to over a year. Your knowledge hard work and experience streamlined the process greatly. Benefits were approved less than 2 ½ months after initial Intent to File. Thanks again for all you have done. I CAN'T THANK STEVE ENOUGH FOR ALL HIS HARD WORK IN GETTING THE VA BENEFIT FOR MY MOTHER. HE LET US KNOW UP FRONT THAT THIS MIGHT BE A DIFFICULT CASE AND THERE WAS NO GUARANTEE THAT HE WOULD BE SUCCESSFUL. EVEN IF IT HAD NOT WORKED OUT TO OUR ADVANTAGE, IT WAS STILL WORTH TRYING FOR. THE PROCESS IS SO COMPLICATED AND LENGTHY AND IS SOMETHING I COULD NEVER HAVE DONE ON MY OWN. ONE OF THE THINGS I SO APPRECIATED WHEN WORKING WITH STEVE IS HIS COMMUNICATION SKILLS; HE ALWAYS RESPONDED TO MY QUESTIONS QUICKLY BY PHONE CALLS OR EMAILS. STEVE'S KNOWLEDGE OF THE VA, HIS DEDICATION AND HIS PERSEVERANCE PAID OFF SO AGAIN I THANK YOU SO MUCH. I CANNOT THANK YOU ENOUGH FOR ALL OF YOUR WORK IN GETTING MY DAD APPROVED FOR THE VA BENEFITS HE SO RIGHTLY DESERVED. I DID NOT HAVE TO WONDER WHAT WAS GOING ON AS YOU KEPT US WELL INFORMED. IT HAS BEEN A PLEASURE WORKING WITH YOU. I WOULD HIGHLY RECOMMEND YOU TO ANYONE ATTEMPTING THIS TEDIOUS PROCESS. We appreciate you helping us getting daddy approved for VA benefits. Thanks a lot!!! We were extremely impressed with Steve Nappier's knowledge of the inner workings of the Veterans Administration. His successful processing of our claim was professional, quick and understandable. Our claim was not an easy one but Steve kept my family updated and educated on the "VA's way" through the whole process. We would recommend his services to anyone needing to wade through the bureaucracy of the VA.
First of all, thank you for your service to our country and for the service you are now providing to all the veterans spouses and dependents. Jerry and I wanted to take this time to write you a short letter of appreciation for all you have done for his mother. When we became aware of this benefit for her, it was such a blessing to know we had a contact person that would be able to assist us with the "federal documents" to ensure all the I's were dotted and it's were crossed as well as the very in depth direction you supplied us with each step. That was the key to making this process so easy and stress free. You were always up-front with information and stressed the importance of each step in the process. We appreciated that! It has been a pleasure to work with you and we highly recommend you to others each day. Please feel free to give my number to anyone for a referral, I don't mind at all. Sincerely, Jerry and Debbie A. The help you provided with our request for a VA pension for my dad was above and beyond anything I expected. You handled all the research and stayed on top of the case, keeping us informed every step of the way. I could not have navigated through the process alone. Your patience and kindness through the process will always be remembered. My Dad now has the resources he needs to continue to live as independently as possible for as long as possible. Thank you seems a small thing to say but it comes from the bottom of our hearts! Pat S. and William R.
I cannot thank you enough for the help you provided in helping Mother to get VA benefits after Daddy passed away. I did all the paperwork myself when Daddy applied for VA benefits. Every time I turned around they were asking for another form to be completed, and the approval took an entire year! You knew exactly what information they needed for Mother's application and handled all of the paperwork. We were approved in just a few months instead of a year. My sister's and I will be forever grateful to you for taking that burden from us. You were always so kind and helpful and were always accessible by phone. You provide a wonderful service to the veterans of this country! MY DAD WAS A WORLD WAR II VETERAN. BEFORE HE DIED, HE COULD NOT REMEMBER YESTERDAY, BUT HE COULD TELL YOU ALL ABOUT FIGHTING IN THE WAR. HE LOVED MY MOTHER SO MUCH AND WOULD BE SO PROUD THAT HIS VA BENEFITS WERE NOW HELPING TO CARE FOR HER. STEVE NAPPIER HELPED US MAKE THIS HAPPEN. HE GUIDED US THROUGH THE PROCESS STEP BY STEP, AND WITHIN 8 WEEKS MOTHER WAS GETTING HER CHECK. THANKS TO HIM, EVERYTHING WENT SO SMOOTHLY. I AM SO GLAD I HEARD ABOUT HIM AND RETAINED HIS HELP. Thank you very much for all the hard work you did in helping me apply for VA's Aid and Attendance benefit for my older sister. I am convinced that I could never have done this on my own. You knew exactly who to contact and where to send the information. Most impressive, you stayed in constant contact with the VA to follow up with the entire process. I was very impressed with how well you communicated with them as well as with us each time there was an update or when something needed to be done. Simply put, you really took an interest in our case and handled everything extremely professional. I would be proud to recommend you to anyone who is getting discouraged trying to get any kind of benefits through the VA. You make the process much easier, faster and less stressful. I am so glad we found you and chose to use your services, even though I lived in a different state. Thank you for a job well done. STEVE DID A FANTASTIC JOB IN FILING FOR VA AID AND ASSISTANCE FOR MY FATHER WHO WAS A WW2 VETERAN. MY DAD RECENTLY PASSED AWAY AND MY SIBLINGS AND I WILL BE USING HIS SERVICES AGAIN TO GET FINANCIAL HELP FOR OUR MOM. HIS EXPERTISE IN WORKING WITH VA CUT THE WAIT TIME FOR MY DAD'S ASSISTANCE BY AT LEAST HALF. I HIGHLY RECOMMEND STEVE IF YOU ARE LOOKING TO HELP YOUR VETERAN PARENT TAKE ADVANTAGE OF THIS OPPORTUNITY VETERANS SO RICHLY DESERVE. Steve, This is a long overdue but well deserved THANK YOU!!! I sincerely want to express how above and beyond you have gone to support first my dad and then my mom with the VA Assisted Care Benefit. To say I could not have done it without you is an extreme UNDERSTATEMENT. As a working professional, I could not dedicate the time to all that's necessary for completing the process efficiently and successfully. Pile on top of that the extreme family dynamics, the fact is I was under unbelievable pressure and trying to achieve the "impossible mission". Thank Heavens our paths crossed. First with my dad, a WWII vet and Honor Flight participant, who we lost last year, and just a fraction short of receiving the benefit. But we were almost there and it was all due to your hard work! Then my mom, after losing dad and with her failing health to where she needed 24 hour assisted care. You stuck by me for months and months with PATIENCE, PROFESSIONALISM, and artistry of how to support and guide me with my mom's application process. What's even more amazing to me is how you CONTINUE to this very day to ensure and follow-up so that Mom does not miss out on any part of this benefit. Thank you, thank you, thank you. With tears in my eyes, there is no way my words can express what I feel in my heart. FIRST, LET ME SAY "THANK YOU" SO MUCH FOR EVERYTHING YOU DID TO HELP MY PARENTS WITH THE VA BENEFIT! I AM SO RELIEVED AND EXCITED THAT THEY WILL HAVE SOME FINANCIAL HELP, IN A TIME THAT HAS BEEN AND IS DIFFICULT, AT THE VERY LEAST! WORDS CANNOT EXPRESS MY GRATITUDE AND WE ALL APPRECIATE YOU AND WHAT YOU DO. My wife and I would like to thank you for the excellent service you provided in helping us get veteran's widow benefits for my wife's Mother. Thanks to you, the entire process took only four months, and the approval was backdated so that my Mother-in- Law can receive back payments. We have already given your name to several interested parties. Thank you so much for assisting me with applying and being approved for my mother's VA benefits for the care she now needs. She will be receiving her first benefit in a couple of weeks. It will be a tremendous help in providing the supervision and assistance in her daily life. Because of your knowledge, experience and efficient way of handling the claim and guiding me through the steps I needed to take it has gone through in a very timely way. Your patience and knowledge in helping me during what was a very stressful time is so appreciated. The fact that I knew if I had any questions you were accessible was always a comfort. If you didn't answer the phone you ALWAYS got right back to me. You were recommended by health care professionals when my mother became ill. We were faced with some overwhelming decisions and what we knew was going to be costly healthcare in what she was going to need on a daily basis. The first day I gave you a call I realized that I had someone who could take much of the stress off and would be able to guide me through the process of getting the VA benefits for a widow of a World War II veteran. Unfortunately, I think many don't realize those benefits are available. I have already recommended you to friends who may not have an immediate need but may have in the future. Again, thank you Steve for you dedication. I couldn't have done it without you. Thank you so much for all your help in filing application on behalf of my husband, Thomas George Varner for Pension Aid and Attendance to the Veterans Administration. Thank you for directing Tom's application to the proper places for consideration. The quick response we received from the VA in approving Tom's application for VA Aid and Pension, is directly due to your hard work and patience with me in getting everything correctly done and submitted in timely manner. This has surely lessened the burden of day to day life for Tom and me in view of the hardship we found ourselves in. My husband and I are so appreciative of your efforts on his behalf and attribute the success in VA's recent approval of Tom's application to your guidance from the beginning of this process. You are such an asset to all veterans in Alabama and we feel blessed to have found out about your hard work on behalf of all veterans in our state. My husband Tom and I would be happy to do all we can to help veterans and spouses in the Lee County area know more about this Veterans Administration program and how it might help them in some way. Please do not hesitate to call us if we can be of help in getting this message to the many veterans in our area of Alabama. Tom and I would be honored to recommend your services to Alabama veterans in need of VA benefits help. WE CAN'T THANK YOU ENOUGH FOR HELPING US GET DAD APPROVED TO RECEIVE VA BENEFITS. YOU WERE SO WONDERFUL TO WORK WITH. OUR FAMILY WAS FORTUNATE TO FIND YOU. YOU WERE EXTREMELY PATIENT WITH MY BROTHER AND ME. YOUR EXPERTISE AND KNOWLEDGE WAS SO HELPFUL WHEN DEALING WITH THE PAPERWORK INVOLVED IN FILING FOR VA BENEFITS. DAD JUST RECEIVED HIS FIRST CHECK. THIS IS GOING TO HELP DAD BE ABLE TO CONTINUE GETTING THE RIGHT CARE DAD DESERVES. THANK YOU FOR ALL OF THE HELP THAT YOU PROVIDED US. WE SO APPRECIATED YOUR PATIENCE AND UNDERSTANDING. YOU HELPED MAKE THIS STRESSFUL PROCESS, MUCH EASIER TO DEAL WITH. WE WOULD BE HAPPY TO RECOMMEND YOU TO ANYONE LOOKING FOR VA BENEFITS HELP. A friend of mine recommended that I speak with Steve Nappier about the availability of VA benefits for the spouse of a war-time veteran, namely my mother who has dementia and needs constant supervision. Steve explained the benefits, answered all our questions, told us what was needed to file a claim, and what to expect. He personally handled all of the required paperwork and filed the claim for my mother. He was always available to answer questions or talk to us about concerns. Within two months my mother was expecting her first check which will assist with the costs of medical needs and caregiver services. Steve acted as liaison between us and the VA, keeping the process simple and stress free. My family is sincerely appreciative for Steve's expertise, his professionalism, and his kind and tactful intervention. 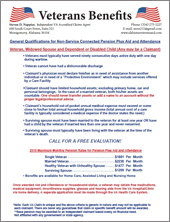 If you are uncertain whether you qualify for these VA benefits, please contact Steve. He is patient, easy to talk to and eager to help. My mother and father recently received the news they are approved to receive the care and aid subsidy granted by the VA for veterans and spouses of the USA military. Thank you very much for all you did to ensure they received these benefits. You handled the entire process from start to finish, thus making it very easy for them. Without you there is no doubt they would not have received these funds. Today was a very good day for our family as our mother received notification she had been approved for the maximum care and aide benefits available for the surviving spouse of a wartime veteran. We are very grateful we found you and are very pleased with your excellent work and professionalism in assisting our mom with her claim to the Veterans Administration. I believe we located you and started the process in late April of the current year and you have been there to guide, direct and assist us every step of the way. Since we did not even have Dad's official discharge papers we had to start with the VA's Records Department before we could even get to the claims division. You knew all the numbers, addresses and contact information and very much simplified a process that could have taken us a great deal of time to learn and sift through. Mother lives in Montgomery and I live in Texas and my brother lives in Birmingham so physically meeting was not available. We were impressed this turned out to be little to zero concern for you due to your knowledge and support via the internet and e-mail. Great job! And, all of this service was for a very fair, reasonable and competitive fee. One of the key items that sold us up front was the fact you pre-qualified our situation and didn't even expect your fee until you were fairly certain mom's condition would allow her to qualify. We greatly appreciate your honesty, integrity and devoted assistance to our family and to the other military service veterans of these GREAT United States of America. My family would be honored to recommend you to any other veteran or surviving spouse of a veteran who would be looking for assistance in application for VA Benefits. "WE WOULD LIKE TO EXPRESS OUR HEART FELT APPRECIATION FOR MR. STEVE NAPPIER. HE HELPED US THROUGHOUT THE ENTIRE PROCESS, AND ANTICIPATED OUR NEEDS. HE WAS BOTH PROFESSIONAL AND KNOWLEDGEABLE; SHARING WITH US EVERYTHING WE SHOULD EXPECT PRIOR TO EACH EVENT. THROUGHOUT THE YEAR WE NOTICED HE WENT ABOVE AND BEYOND, AND THAT TOOK A LOT OF STRESS OFF OUR FAMILY. THANK YOU STEVE FOR YOUR COMPASSION AND EXPERTISE. DAD HAS RECEIVED HIS V.A. AID AND ATTENDANCE, RELIEVING FINANCIAL STRESS THESE LAST FEW YEARS OF HIS LIFE. YOU ARE A BLESSING!" "Thank you so much for all the help you provided in procuring the needed VA benefits for my mother. I am sure we would not have received the benefits without your help and professionalism. You made sure all the necessary documents and paperwork was completed properly. The extra income is greatly needed to help with my mom's daily care. Due to your knowledge and expertise, we received the benefits in under three months. Thanks again." "MY SISTER AND I WANT TO THANK YOU SO MUCH FOR YOUR HELP IN GUIDING US THROUGH THE PROCESS TO OBTAIN ADDITIONAL FUNDING FROM THE VETERAN'S ADMINISTRATION FOR EXTRA HOME HEALTH CARE FOR OUR MOM. THE PROCESS WAS MORE COMPLEX THAN WE WERE AWARE AND YOUR GUIDANCE SURELY HELPED MAKE THINGS EASY FOR US. YOUR QUICK RESPONSE TO OUR EMAILS AND PHONE CALLS WAS GREATLY APPRECIATED. THANK YOU AGAIN FOR YOUR ASSISTANCE." "JUST A NOTE TO THANK YOU FOR ALL YOUR HELP WITH THE VA AND MY MOTHER'S BENEFITS. YOUR PROFESSIONALISM AND KNOWLEDGE ON THE SUBJECT MADE EVERYTHING GO VERY SMOOTHLY. THE BENEFITS MOTHER IS RECEIVING MAKE A DIFFICULT SITUATION SO MUCH MORE MANAGEABLE. THANK YOU AGAIN FOR EVERYTHING YOU DID ON BEHALF OF MY MOTHER. I WISH MORE PEOPLE WERE AWARE OF THESE BENEFITS AND YOUR EXPERTISES WITH THE VA."
"WE HAD NO IDEA HOW RELATIVELY EASY THE VA APPLICATION PROCESS COULD BE - THAT IS THANKS TO STEVE'S EXPERTISE. HE WAS ABLE TO TELL US EXACTLY WHAT DOCUMENTATION WE NEEDED, THOUGHTFULLY APPRAISED OUR SITUATION, AND LET US KNOW OUR CHANCES OF GETTING THE BENEFIT. IN JUST FIVE SHORT WEEKS, WE ACTUALLY GOT WORD FROM THE VA THAT WE NEED AND GOT THE MAXIMUM WE COULD GET FOR OUR SITUATION! WORKING WITH STEVE WAS WELL WORTH IT - I HIGHLY RECOMMEND THAT VETERANS TAP THIS RESOURCE AND COME TO STEVE FOR GUIDANCE!" Thank you very much for helping me get my mother's Aid & Attendance back on track. Since the VA had an incorrect address it caused the payments to stop. Your quick response to the issue resumed the payments with minimal down time and the VA issued the back check which we missed. I could not have gotten this done on my own so I appreciate your promptness. When you first mentioned to a caretaker at my mother's nursing home that there was an assistance program for veteran's spouses, I was skeptical that we could wade through the government bureaucracy and actually get anything accomplished. I'll have to say, not only did you do just that but also you did it with better timing than I would have thought possible. Since I live in Colorado it would have been extremely hard to accomplish this process without you and I will always be grateful for your service. It has been a pleasure dealing with you on these matters. Thanks for your attention to detail and continuing interest in helping things run smoothly. MR NAPPIER KINDLY ASSISTED MY DAD IN GETTING APPROVED FOR THE AID AND ASSISTANCE PROGRAM THROUGH THE VA. HAVING THIS EXTRA INCOME GIVES ME GREAT PEACE OF MIND IN MAKING SURE MY DAD WILL RECEIVE QUALITY CARE FOR THE REST OF HIS LIFE. I AM HIS ONLY LIVING CHILD AND THE RESPONSIBILITY FOR HIS CARE HAS BEEN A HARDSHIP FOR ME OVER THE PAST FEW YEARS. I HAVE BEEN RECEIVING CANCER TREATMENTS, WORKING FULL TIME AND CARING FOR MY 89 YEAR OLD DAD. IT HAS NOT BEEN EASY BUT NOW I FEEL SECURE IN THE KNOWLEDGE THAT HE NOW HAS THE FINANCIAL RESOURCES TO QUALITY CARE EVEN IF I BECAME UNABLE TO CARE FOR HIM. MR NAPPIER SPENT MANY HOURS PREPARING ALL HIS PAPERWORK AS REQUIRED BY THE VA AND THE APPROVAL CAME IN LESS THAN 6 MONTHS. HIS ASSISTANCE IS GREATLY APPRECIATED AND I WOULD RECOMMEND HIM TO ANYONE NEEDING HELP WITH THEIR CLAIM. MOM PASSED AWAY. THANKS TO HER VA BENEFIT (AID AND ATIENDANCE) SHE WAS ABLE TO SPEND HER LAST MONTHS AS SHE HAD WANTED TO. SHE PASSED AWAY IN PEACE AND COMFORT. I SPEAK FOR THE ENTIRE FAMILY WHEN I SAY THANK YOU FOR YOUR EFFORTS. HAD IT NOT BEEN FOR YOU, WE WOULD NOT HAVE KNOWN ABOUT THE BENEFIT. EVEN HAD WE KNOWN ABOUT THE BENEFIT, THE PAPERWORK WOULD HAVE BEEN OVERWHELMING. I HOPE YOU ARE ABLE TO CONTINUE YOUR WORK AND HELP AS MANY FAMILIES AS POSSIBLE. THIS BENEFIT WAS A BLESSING. I AM ALSO VERY PLEASED WITH THE FUNERAL TRUST YOU DID FOR MOTHER. I WOULD HIGHLY RECOMMEND YOUR SERVICES TO OTHERS. I highly recommend Steve Nappier in assisting anyone with negotiating the Veterans Administration benefits. I was in the process of trying to obtain elderly benefits for my 88 year old dad. When I was recommended to Steve I had tried to maneuver the VA paper work on my own without any success, it was very overwhelming. Steve filled out the paperwork as he explained each step to me. Steve was a life sever for me. He told me it would probably take about 6 months for the VA to process my request; but I was so pleasantly surprise when I heard from the VA in about two months that my claim had been accepted. Steve also guided me in trying to consolidate my dad's insurance policies. He was paying on all these different policies each month and had been for years. So, now all his policies are in one burial policy and he doesn't have to pay another dime on them. This absolutely saves him money. If you need help, please don't hesitate to call on Steve Nappier. He is a great person to work with. Thanks Steve, W. and N.
I wanted to say THANK YOU from the bottom of my heart for helping me get the proper paper work filled out and filed for my Dad to receive VA benefits. I know that without your assistance I would still be waiting in the VA Office and worrying about the welfare of my 89 year old Father. We are so thankful to have met you and received your expertise in VA affairs. I no longer have a 1000 pound weight on my shoulders, and my Dad is being taken care of thanks to you. I have recommended you to several people I know that need help with VA benefits YOU know your stuff! Thanks again. Just received an envelop from the Department of Veterans Affairs, I opened it with the same degree of anxiety that I had when I received my notice from the State Board of Pharmacy stating if I has passed or failed my license exam in Dec 1968. I passed and Mother was approved at the max rate. She will receive $1056 per month effective January 1, 2011. This was an answered prayer [as her care costs had] gone up to $112/day and I had to increase the sitters hours to 30 a week ($300). I want to THANK YOU for all of your assistance with the process. I could NEVER have done it without your company's involvement. Mother is extremely happy with her care, it has been wonderful. I have told several of my friends that have similar situations about your agency and now I will have a positive outcome to tell them. Looking forward to working with you when we have to reapply. I am so glad you were recommended to me by a friend. Not only did I not know about VA Benefits, but the paperwork would have been a nightmare to deal with. You handled everything with expertise and treated me like a family member. Your concern and kindness put me at ease and was greatly appreciated. Because of you, my husband was awarded Aid and Attendance. He can now stay at his home where he feels comfortable and live with dignity he so rightly deserves. I can't thank you enough for your help.